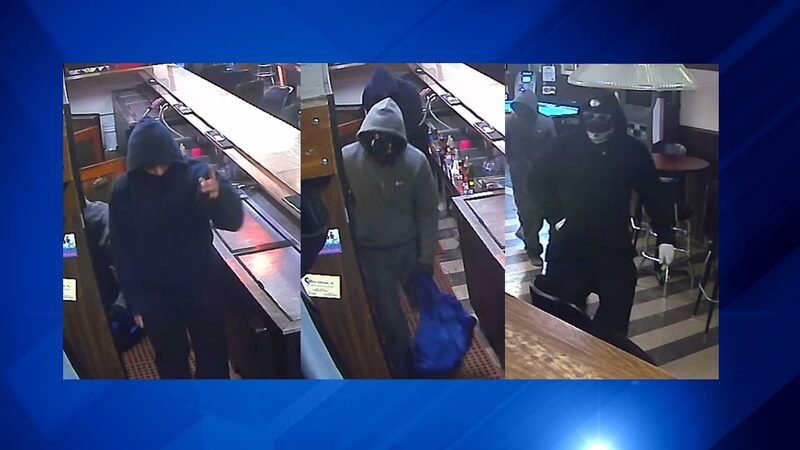 AURORA, Ill. (WLS) -- Aurora police have released surveillance photos of three suspects in an fatal armed robbery in a social club Sunday. Police say the robbery occurred at the Latin American Club around 5:30 a.m., when the suspects entered the club and demanded money from men who were cleaning the building. According to police, the suspects then almost immediately attacked the cleaners and beat them until they were unconscious. The victims were taken to area hospitals. Felipe Garcia, 79, died around 10:30 p.m. due to his injuries. The other victim remains hospitalized for non-life threatening injuries. Police say at least one of the suspects was armed with a large knife similar to a machete. All three suspects escaped with cash and liquor. All of the suspects covered their faces; two wore masks. All three wore hooded sweatshirts: one black, one blue and one gray. If you have any information about any of the suspects, call Aurora police at 630-256-5500 or Aurora Area Crime Stoppers at 630-892-1000. All callers to Crime Stoppers are anonymous and qualify for a cash reward of up to $5,000 for information leading to arrests.